At virtually the second it was confirmed that Joey Carbery was heading to Leinster, this annual Aviva date seemed to have a classic “Master v Apprentice” narrative baked right in. But when Johnny Sexton started three weeks in a row during the month of September for the first time since we got to sew stars on the blue jerseys, it started to look like we might be denied this marquee billing. I suppose the six-day turnaround to the pivotal Euro date with Wasps is a mitigating factor, but it’s still a disappointment, not least to himself as I reckon he would play two matches a week if he was allowed. So that’s it. No head-to-head match ups to look forward to, right? Eh, wrong!!! Just look at the back rows will you? Peter O’Mahony, Tommy O’Donnell and CJ Stander is a formidable trio indeed. Surely few Irish fans would be worried seeing them start together at test level. And while the same could be said for our own 6/7/8 combo of Ruddock, Leavy and O’Brien, each has had time on the sidelines of late so their ability to keep up with what is likely to be a merciless breakdown battle could well be key to deciding this latest derby. And it certainly doesn’t end there. Devin Toner and James Ryan v Jean Kleyn and Tadhg Beirne has a fascinating ring to it as well, both in loose play and at lineouts in particular. Then there’s the all-Kiwi sub-plot at 9 between Messrs Gibson-Park and Mathewson...both have excelled at times this season and while both have been in Europe for a couple of years, it will be interesting to see if they’re both tempted to revert to some southern hemisphere trickery to gain an edge here or there. And when you think about it, the Ross Byrne v Carbery deal has it’s own interest. You could hardly have a better stage for the former to show that the latter’s switch won’t cost Leinster too much, and much will rest on how much he clicks with his fellow halfback. Then there’s Rob Kearney making appearance number 200...we all know he’d have passed that a long time ago but for test call-ups and injury layoffs but it’s a notable achievement all the same and also should Luke McGrath be called on from the bench he’ll be earning his 100th cap. 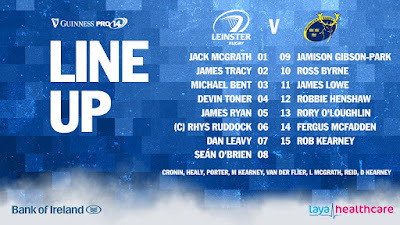 Overall, Leinster’s lineup looks to me to be mostly a bit bench-heavy if anything, with Munsters the exact opposite? The visitor’s back line has tons of attacking options that can hurt us so a lot of pressure will be on our starters, particularly Henshaw and O’Loughlin in the centre, to keep our the Keith Earls and the Andrew Conways. But should we be there or thereabouts on the scoreboard coming into the final half hour, we have a formidable front row to unleash, not to mention Josh ‘tackles-anything-that-moves’ van der Flier. So with that in mind, I’m thinking it’s going be very important for us to make every sniff of a chance count in the early stages, and if we can get James Lowe involved in those chances I’d be liking our odds. The bookies have a home win by 7 points. I’d take that hands down but I reckon it’s going to be closer. As always we’re bound to have a controversial referee’s decision (Ben Whitehouse has the honour this time) or three to mull over after this one and they are likely to keep it tight...I reckon we’ll pip it by 3-5 with the lead changing hands a few times throughout. PS - as always best of luck to Leinster A, this week they try to keep their 100% start to the Celtic Cup going by travelling to face the Dragons. And the men's AIL kicks off this weekend... get out and support your local team if you can. 1 Dave Kilcoyne, 2 Niall Scannell, 3 Stephen Archer; 4 Jean Kleyn, 5 Tadhg Beirne; 6 Peter O’Mahony (C), 7 Tommy O’Donnell, 8 CJ Stander. Replacements: 16 Kevin O’Byrne, 17 James Cronin, 18 Ciaran Parker, 19 Billy Holland, 20 Chris Cloete, 21 Duncan Williams, 22 JJ Hanrahan, 23 Rory Scannell. 16. Dan Sheehan 17. Giuseppe Coyne 18. Jack Aungier 19. Ryan Baird 20. Ronan Watters 21. Patrick Patterson 22. David Hawkshaw 23. Liam Turner.